Morning Prayer, finally, back in the church (Advent Feria). As lovely as sitting by the fireplace is, it’s hard to do. I’m easily distracted. I rush. A surprising crowd at mass in the morning. Even though it has only been two days since I’ve said mass/received communion, it has felt like two weeks. The morning work involved working on a funeral for the weekend, which will, liturgically, see a merger of two different cultures, neither of which is my own. I went to lunch with our choirmaster, who was my first hire nine years ago. We worked out details for the 2019 liturgical calendar. Ideally, this would have been done months ago, but all of us in the office are raging Type B’s with idiosyncratic Type A behavior. After lunch I had a meeting with parish finance leaders and representatives from our new bank regarding financing for our capital campaign. This is uncharted territory for me, which is why it makes me nervous and also why I need it. This has been a fascinating experience and not the easiest sell over the whole parish. Many individuals have supported the campaign with significant gifts and pledges (nearly 2 million) but the support is from a minority of the parish. It’s a different kind of campaign. It did not come from a grassroots movement to build a classroom or parish hall or something that is easily seen as practical. I found myself presenting the “business model” to the bankers. Once upon a time, people might have given to the church so that priests would say requiems for their souls once they had died. They might have given out of a real sense of gratitude. People today may still give for the same reasons, but the motivation to worship and support is harder and harder to generate. Our “product” is a saving, transformative relationship with Jesus Christ. We “market” that product through inspiration. How does one deliver inspiration? Through charitable works? Yes, and many have asked why we aren’t focusing on our homeless shelter. Mainly because, as important as this has been for us, we want to be out of the shelter business. This is one business model where we don’t want consumers! And it’s working. Last year on December 10, we had 17 guests in our shelter. This year, with 14 inches of snow on the same day, we had 8. That’s good news. God willing, in three or four years, we can close down the operation because it is no longer needed. The same thing is true about our young adult year of service program. For seven years we hosted The Abraham Project, a powerful ministry to and with young adults. We nearly bought a house for the project. The needs have changed and fewer young adults are doing year-of-service programs and we had to close our project this year. What is the one thing that will always be current, always be necessary, and will always inspire? The worship of our Lord. The altar and the font. Adoration is the best and longest (as in eternal) investment we could ever, ever make. There is nothing more practical, but the results are often delayed. I am grateful for wise minds who understand markets, points, interest rates, zzzzzzzzzzzzzzzzzzzzz. More admin after the meeting and off to Evening Prayer. For some time now, we’ve read a portion from the Rule of St Benedict at Evening Prayer. I borrowed this practice from Norwich Cathedral, which is near to my heart. Norwich Cathedral was once a Benedictine Priory and they still recite the Rule as a nod to this important heritage. I am also an oblate with the Order of St Benedict (St John’s Abbey in Collegeville, Minnesota). The reading for December 11 was the beginning of Chapter 58, The Order for the Reception of Brethren. 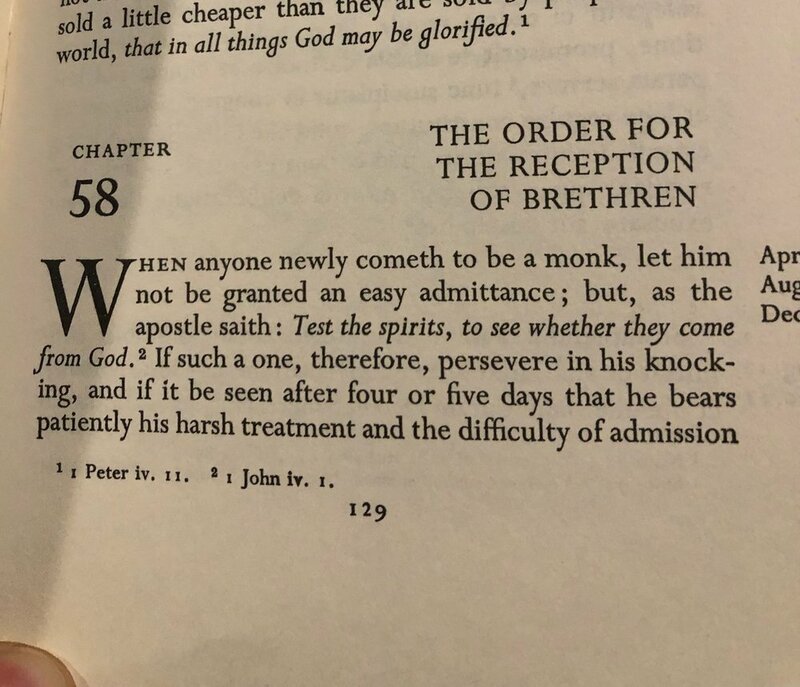 What struck me was how hard Benedict made it for brothers to enter the monastery. Test them to see if they are serious. It stood in direct contrast with a video I saw earlier in the day by comedian John Crist called “Virtual Church.” It was satire, but not by much. I know Benedict was speaking to monks, but surely there is something for us learn. The gap between the Holy Rule and Virtual Church is both deep and wide. After Evening Prayer I gathered my things and went to the empty parking lot to go home. My car, however, had different plans. Rest eternal grant unto it. Always make friends with mechanics. A text message exchange revealed a dead starter. Good thing we are Easter people.